The SGMPH servomotor series has a medium inertia design with a flat profile providing the highest torque-per-length ratio available. 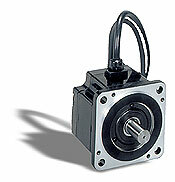 These servomotors are well suited for applications requiring optimized load matching. There are five frame sizes providing up to 2,027 oz-in of peak torque. 100 and 200 volt windings are available with rated speeds of 3,000 rpm and maximum speeds of 5,000 rpm. An 8,192 ppr incremental serial encoder is standard. The SGMPH is rated IP67 (not including the shaft) providing resistance to moisture. Options include a 65,536 ppr absolute encoder, gearmotor, shaft seal, and holding brake.